Facts have emerged on why 20 out of the 24 Members of the Abia State House of Assembly voted for the Impeachment of its Former Speaker Rt Hon Martins Azubuike. It will be recalled that the Abia State House of Assembly had yesterday Elected Hon Bishop Kennedy Njoku as its New Speaker after the removal of Mr Martins Azubuike as the Speaker of the House. Findings by PUO REPORTS has shown that the Members of the State House of Assembly had complained bitterly for Months over the Leadership style of the Ex-Speaker whom they accused of running the Assembly like a Personal Estate. The Ex Assembly Speaker was accused of not carrying Members of the Assembly along in the distribution of Funds and allocation coming into the Assembly. At the Sitting Yesterday,the Deputy Speaker of the House, Rt Hon Cosmos Ndukwe, who presided over the plenary, said that 20 out of 24 members signed the impeachment notice against Azubuike. 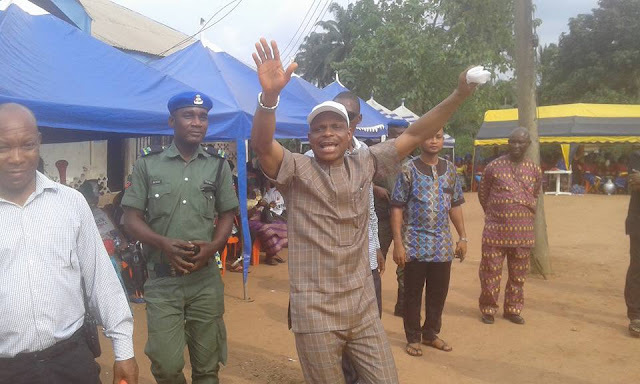 During the election conducted by the Clerk of the House, Mr John-Pedro Irokansi, Hon Bishop Kennedy Njoku Member Representing Osisioma Ngwa North State Constituency, polled 17 votes to defeat Chief Chikwendu Kalu, representing Isialangwa South Constituency, who polled three votes. The Deputy Leader of the House, Chief Solomon Akpulonu, representing Obingwa East Constituency, who moved the motion for Martins Azubuike’s removal, gave reasons for the action. Akpulonu said that Azubuike “failed to ensure equitable distribution of positions and powers among members,” adding that he was “insensitive to the rights and needs of members and general staff of the assembly. ” He further said that “his autocratic practice has brought the assembly on collision course with other arms of government and agencies of the state government. “He has abused the office of the Speaker by using same for personal and private political interest. “Therefore, pursuant to Section 92 (2c) of the 1999 Constitution of the Federal Republic of Nigeria as amended. We, the members of the House, resolved to remove and hereby removed Martins Azubuike as Speaker,” Akpulonu said. In his acceptance speech after his swearing in, the new speaker thanked members for the confidence reposed in him. Njoku gave assurance that the House under his leadership would make laws for the good governance of the state. He said that the task ahead of the House was challenging adding that he appreciated the circumstances surrounding his emergence. In a brief interview with newsmen, Njoku also promised to give every member a sense of belonging and avoid ‘’the banana peels’’ that swept off his predecessor..